Hennadiy Afanasyev, the Ukrainian citizen who was returned to Ukraine from Russian imprisonment in a successful swap operation, through foreign reporters urged foreign governments not to lift sanctions against the Russian Federation, an UNIAN correspondent reported from a briefing held after Afanasyev’s and Yuriy Soloshenko’s meeting with Ukrainian President Petro Poroshenko. "If there are foreign journalists here, I want to you to address you. I’ve gone through torture and pain, just like many others. I am asking you to not abandon the sanctions, to continue with this policy, to not cancel any [sanctions]... Thank you. Don’t abandon [the sanctions]. And maybe Oleh Sentsov, Oleksandr Kolchenko and other Ukrainian political prisoners will return soon," Afanasyev said. As UNIAN reported earlier, Russian President Vladimir Putin has signed a decree to pardon the wrongfully convicted Afanasyev and Soloshenko. The aircraft of the Ukrainian Defence Ministry with Ukrainian political prisoners Yuriy Afanasyev and Hennadiy Soloshenko earlier today landed at airport Boryspil, and both Ukrainians were immediately taken to hospital. 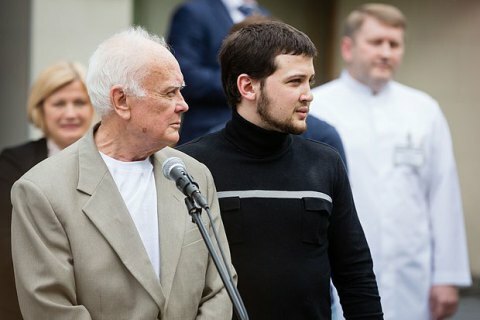 SBU chairman's adviser Yuriy Tandit said that Afanasyev and Soloshenko had been exchanged for two Russian citizens who were related to the tragic events in Odesa on 2 May 2014.